I’ve tried a fair few ModelCo products over the years, with the ModelCo More Brows Tinted Brow Gel being one of my favourite brow gels. 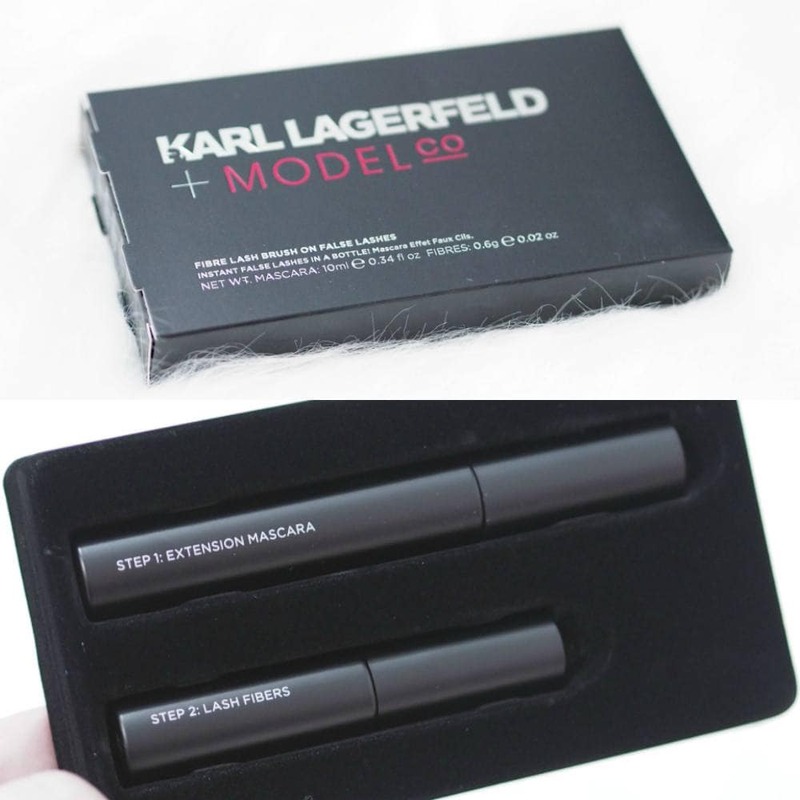 If you follow Cult Beauty on Instagram, you’ll definitely have seen their announcement that they were stocking the exciting limited edition Karl Lagerfeld x ModelCo Collection and I couldn’t wait to see which products were included within the collection. I’m so surprised by how large the collection is with 22 different products in total, with some products having multiple shades so I love that Karl and ModelCo have chosen to create a large collection rather than just a couple of products and I have a selection of products to show you as well as swatches. ModelCo Collection are an Australian beauty brand and they’ve partened with fashion icon; Karl Lagerfeld to create a collection of makeup products which launched on the 14th of May, and Cult Beauty are the exclusive UK stockist. 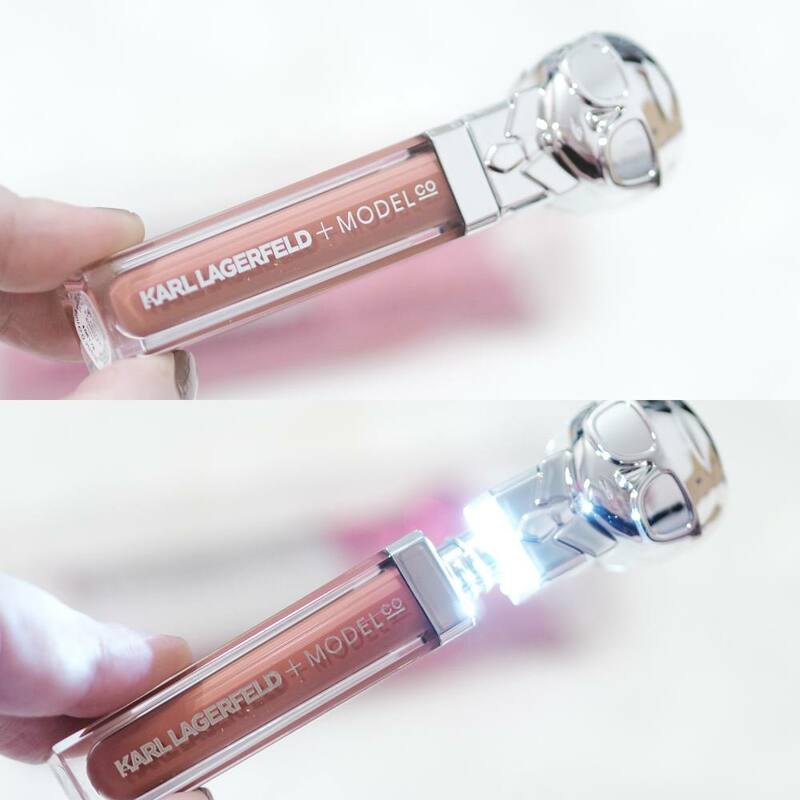 The limited edition colour collection combines Karl Lagerfeld’s iconic character with ModelCo’s beauty expertise and renowned quality. 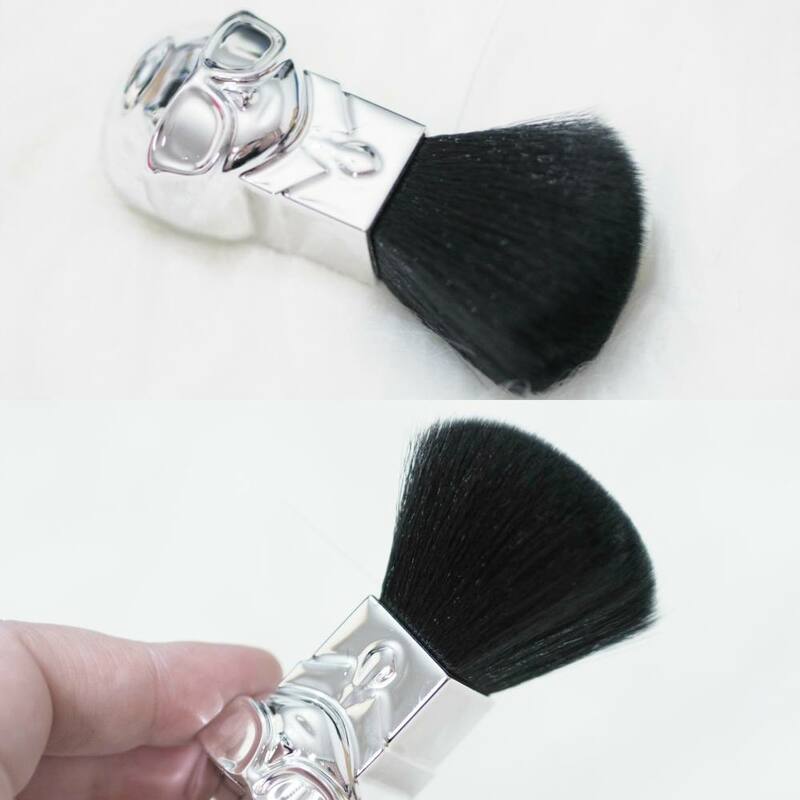 If you’re a massive Karl Lagerfeld brand, I really think you’ll like the Karl head shaped branding which features on quite a few of the products and this brush is no exception. The handle has a chunky, silver chrome plastic Karl Lagerfeld bust, depicting his iconic glasses and ponytail look which won’t be for everyone, but those that prefer a more kitcsh twist will appreciate how unique the design is. 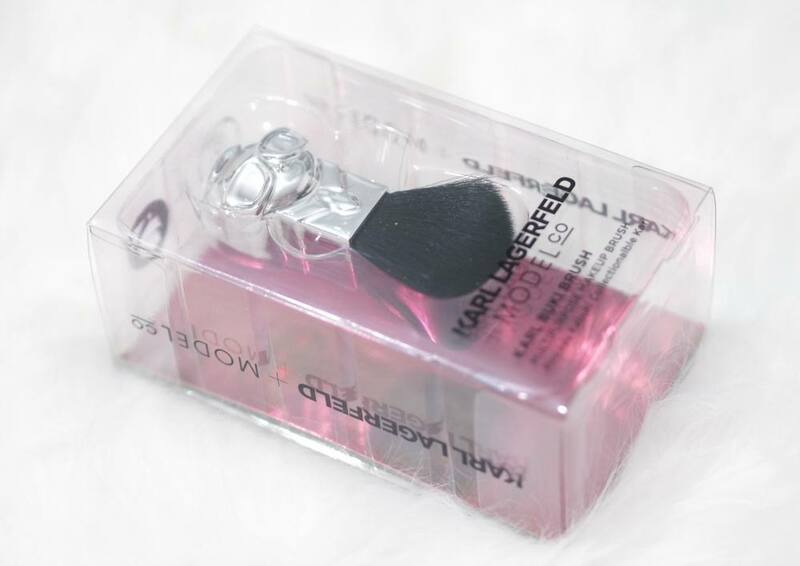 The whole Karl Lagerfeld x ModelCo Collection is cruelty free, so the bristles of the Karl Buki brush are synthetic and work well for applying powder products. If you don’t fancy the makeup products within the collection, but you still want something from the collection these quirky stickers could be a good option. 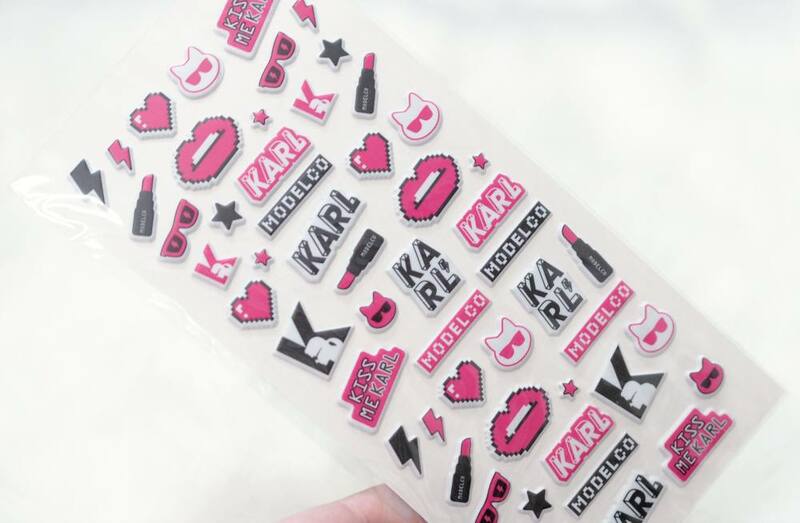 There are 24 stickers in total and the designs feature Karl, his cat Choupette and lots more in a black, pink and white theme. I do think they’re quite pricey for stickers, but I guess you’re paying for the Karl Lagerfeld name and it’s limited edition so they won’t be around for long but you can use them anywhere. I bought the ModelCo x Dannii Minogue Instant Lashes Brush on False Lashes in early 2011 way before I even considered starting a beauty blog, so they’re obviously a super popular product for the brand for it to be still in production today and they were £35 then so it’s amazing the price hasn’t increased since then. I don’t know if this is the exact same formula as their standard Fibre Lash Brush On Lashes which is £25 but the packaging is different, as these have a sleek black design and their original formula is silver. 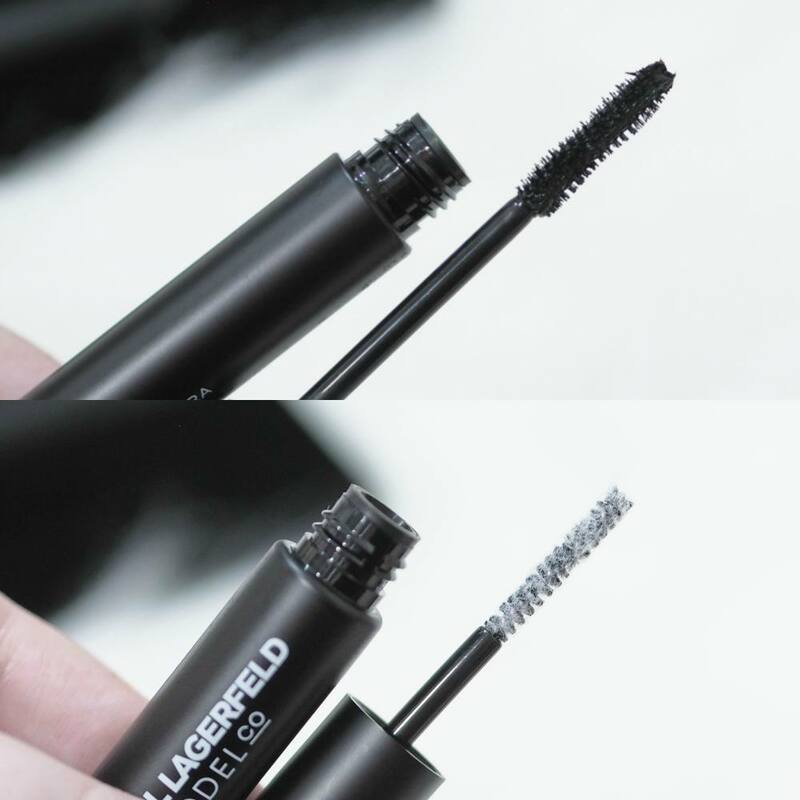 This is an fibre lash extension set where you apply the mascara first, and then the second step which has a mascara wand covered in miniature white nylon fibres which adhere to the wet mascara coated lashes and you finalise by covering the white fibres. You can choose to apply multiple coats of the mascara and fibres, but it does create a very dramatic look. It’s very effective at making the lashes more dramatic and voluminous, and could be a great option if you’re allergic to lash adhesive but still want the drama you get with wearing false lashes. I particularly like that you can apply as little or as much of the fibres as you want, so you can vary the drama and you don’t have to worry about your lashes popping off either. If you like a more minimal lip product, this lip balm is for you with two different colour designs of the packaging; fuschia pink chrome or silver chrome. 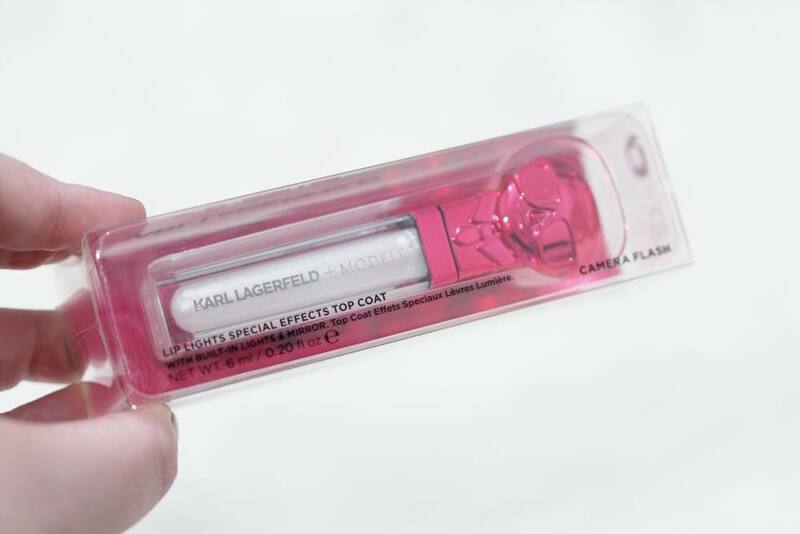 The lipbalm is packaged within a large Karl head, and the top of this head unscrews to reveal the lipbalm inside. The luscious lip balm hydrates, protects and plumps lips, enriched with moisturising shea butter, jojoba seed oil and protective vitamin E. The balm has a really lovely fruity scent and taste when on the lips, and does a nice job at moisturising the lips. 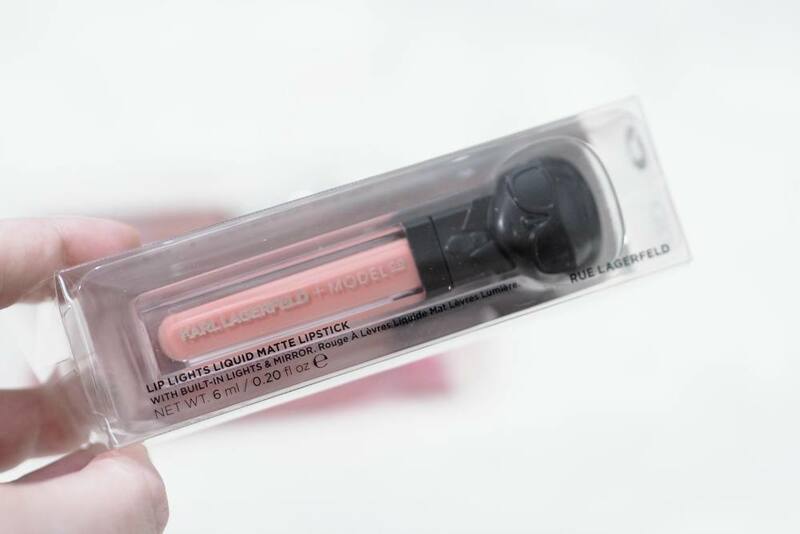 The packaging is a marmite kind of situation where you either love it or hate it, but it’s possibly one of the fanciest lipbalms you can pull out of your bag to apply when on the go. 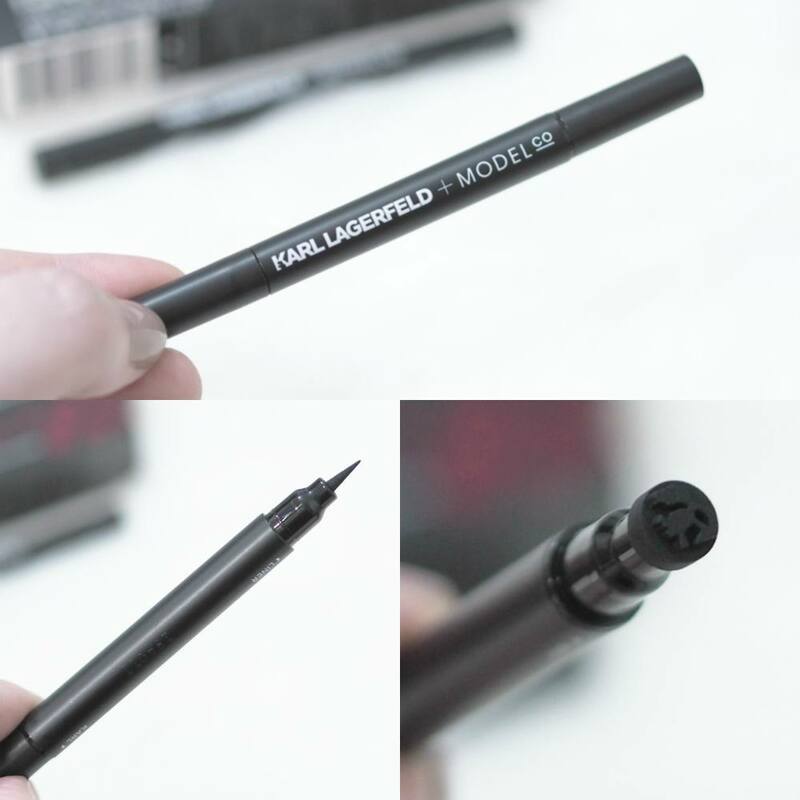 These are possibly one of the most unique items within the collection, and are dual-ended eyeliner pens with a felt tip liner on one side and a stamp on the other. The eyeliner end is an amazing super-fine, water-resistant felt tip liquid liner which is a dream to apply with the perfect flexibility allowing you to create a liner as thick or thin as you want. It did bleed a little in my swatches above but it doesn’t bleed on the eyes, but it’s a very intense black with a satin finish once dried. The liner in my opinion is worth the £24 alone, but the stamp feature is a nice extra. The Karl stamp is of his face with his sunglasses and pony tail, and the Choupette (Karl’s cat) has sunglasses on too. 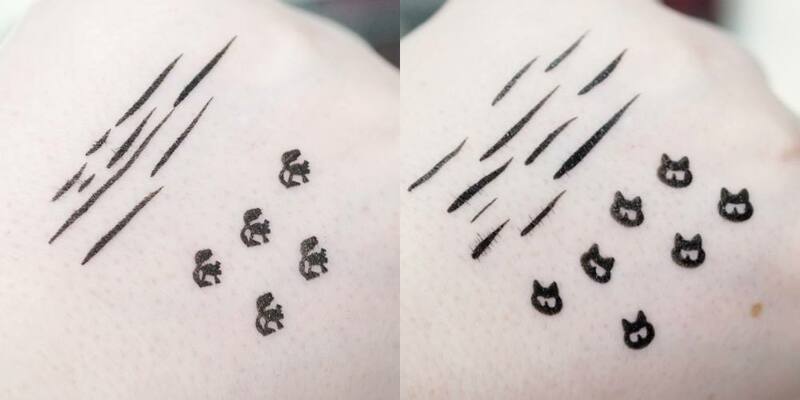 In all honesty I don’t have the lifestyle to be able to pull off the stamps, but they’re very saturated with liner and are easy to ‘stamp’ on the skin. 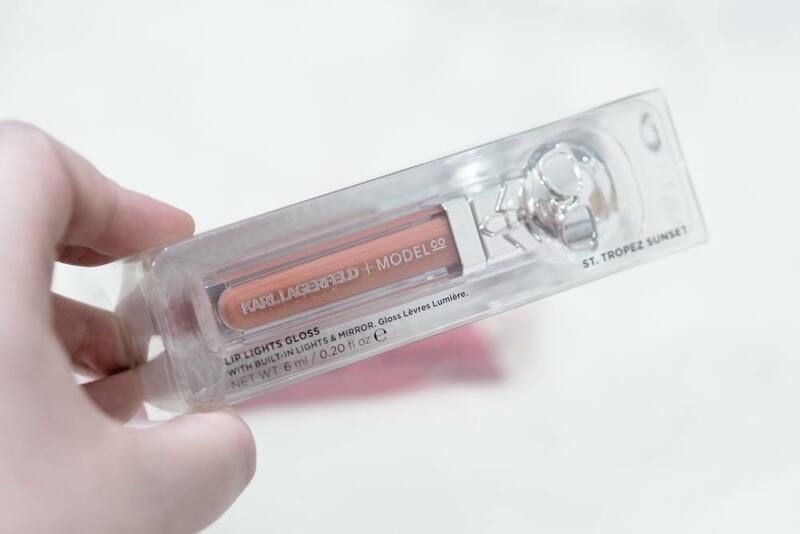 The Lip Lights Collection all have the same packaging design within a clear plastic tube, a mirror on one side and a very bright light when you twist the lid off which is fantastic if you wish to reapply your lip colour when in the dark. 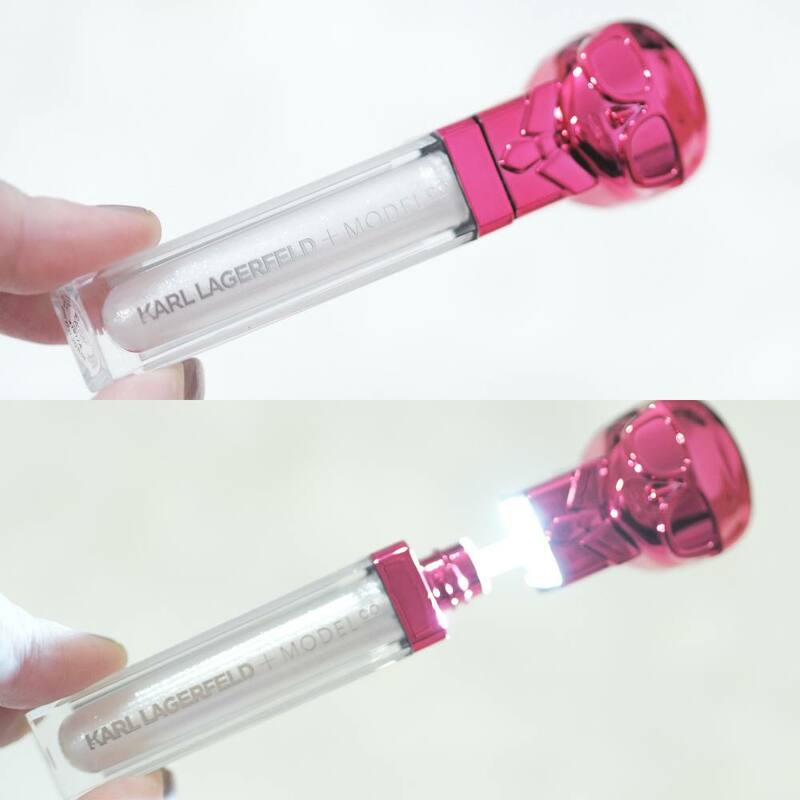 The lid of each of the three formulas all have the iconic Karl bust, in silver, pink and black with a doefoot applicator. The Lip Lights Gloss is available in eight shades, and St. Tropez Sunset is a dark rosy pink, which is quite sheer on the lips but is very comfortable without feeling sticky. The Lip Lights Special Effects Top Coat is available in four shades and I have Camera Flash which is a stunning clear gloss with multi-dimensional shimmer and glitter pieces making it a perfect top coat for any lip colour and they make the lips look so plump and hydrated. 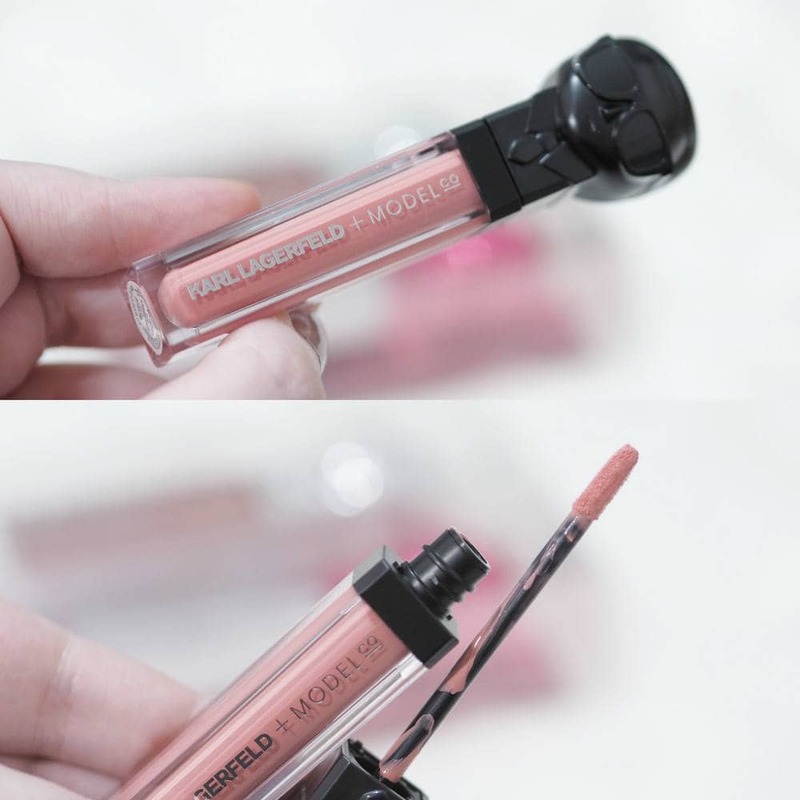 The final product I’ve been trying is the Lip Lights Matte Lipstick in the shade Rue Lagerfeld, and there are seven other shades if this shade doesn’t appeal. 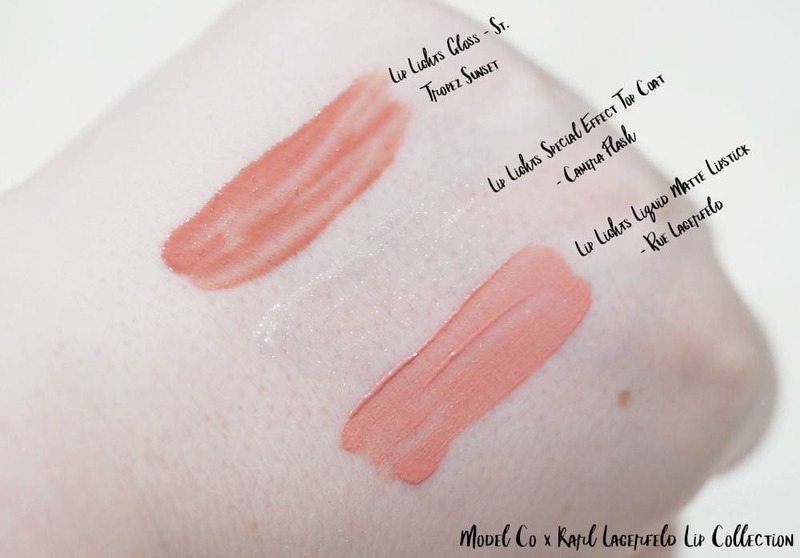 Rue Lagerfeld is peachy pink which looks so pretty when worn with the St. Tropez Sunset Gloss. The matte lipstick is more pigmented than the gloss and is best applied in two thin layers to prevent patchiness and it doesn’t feel too drying either. 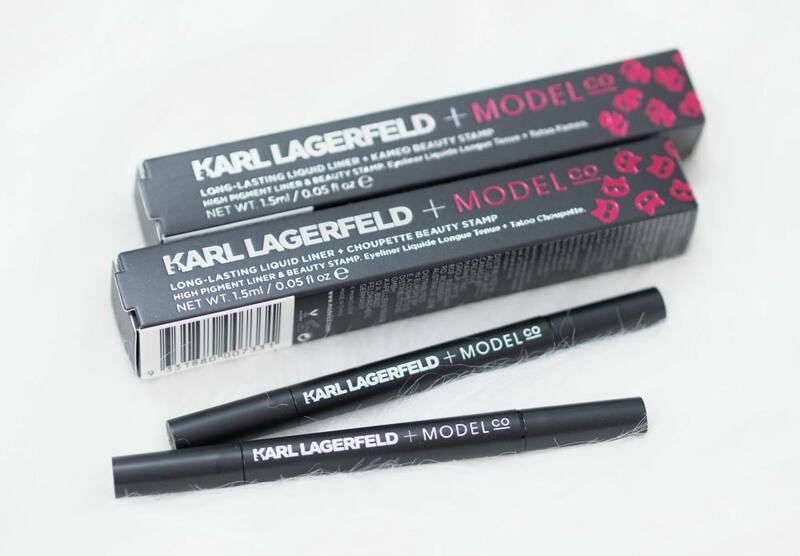 I’d love to know your thoughts on the Karl Lagerfeld x ModelCo Collection? Which is your favourite product? You can find the whole range over on Cult Beauty and they currently have free shipping on the range too.